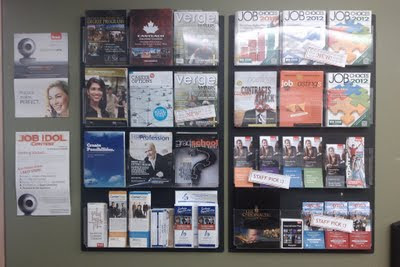 Brock CareerZone Blog: "The Wall"
People often awkwardly prop themselves infront of this magazine rack and stare at the wall with a look of confusion or maybe hope - as if the magazine with the perfect article is going to jump into their hands. Don't be afraid of the magazine wall, just grab a bunch of them (please), its free! 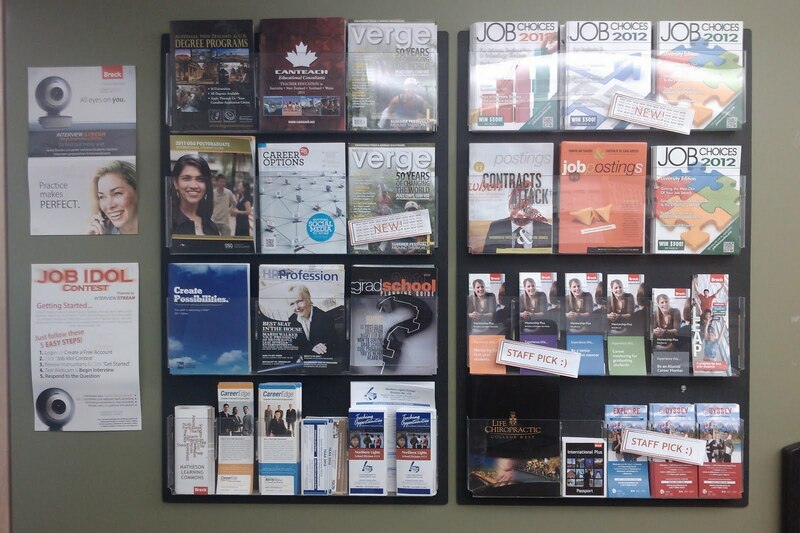 Career Services' magazines cover topics for everyone: finding entry-level jobs, career trends, grad school, teaching & work abroad, jobs in business/technology/arts and so much more! My favourite magazine is Fuel Inc. It's a Canadian magazine that comes out once a year and relates today's careers to the jobs of our favourite television characters. 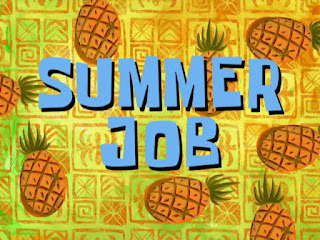 Let's face it, TV is where many of our "when I grow up I want to be a..." moments rooted from. This magazine's approach has a fresh way of providing valuable information. In fact, the magazine was so cool we're all out! I'm excited to see the new edition this Fall. Get your copy while it's hot; these magazines are only mailedto high schools, colleges and universities. I've read every magazine on that wall and I can honestly say it's good stuff. When I was considering post-grad, I read the grad school planning guide and it answered a lot of questions which made my decision very easy. A past co-worker was obsessed with the SWAP magazines and she's actually going to work in Ireland soon. In addition to magazines, we receive mail from organizations, employers and post-grad schools and we squeeze them in when we can. So, next time you're walking by the Resource Centre know it's ok to stop and have a look!